Former Rare Devs Playtonic Want Donkey Kong Country Villain K. Rool In Super Smash Bros.
"Let's get another of our artists' beautiful children into the fight"
Nintendo has opened up voting to see which characters its fans want to see in Super Smash Bros., and this has predictably led to some rather outlandish recommendations. 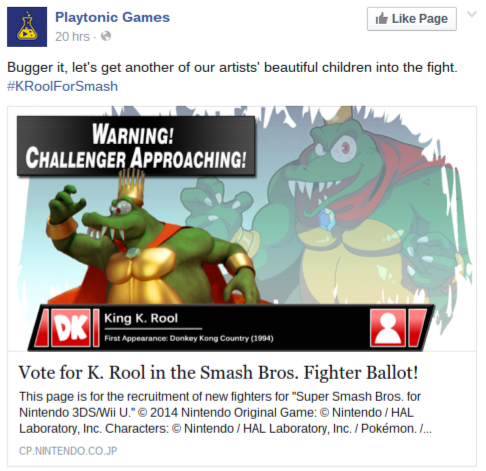 UK studio Playtonic - made up of former Rare developers - has thrown its hat into the ring by suggesting fans should vote for King K. Rool to appear in the popular fighting series. K. Rool is an antagonist from the Donkey Kong Country series, which was developed by Rare when it was under Nintendo's wing. Given that Donkey Kong and Diddy Kong are already part of the roster (the latter of which is a character created by Rare but owned by Nintendo, like the rest of the DK universe), this isn't actually that strange a request. Should K. Rool got enough votes, there should be a decent chance of him making the cut. Would you like to see Kong's nemesis feature in a future DLC update, or are you more of a Funky Kong fan? Sound off in the comments below. Many people would agree with them since it's King K. Rool. But I don't care anyways. Yes! Bring on King K. Rool! It's who I voted for! I'm not sure why everybody want King K Rool in Smash. I'm sure he would be good but there are many other players I'd rather see like Waluigi, Toad, and Rayman(?). Maybe it's just because I never was into Donkey Kong. It's turning into a freakin presidental election! I wouldn't mind it if he made the cut. For me personally though, I cannot stray away from how fantastic Shovel Knight would be to the line up. I think it would be nice if the DK series finally got it's villian. Seems like a natural course of action in the Smash games, really. I have no objections to it. Seriously, though, this is crazy what happens here. I mean, even if we get a new chara for SSBU, it will take months for them to make the chara and then, we have to pay for it. In the end, there will be a lot of people, who will say "THAT IS NOT THE CHARA I WANTED!!!! F U NINTENDO" and people will cry even more and drama will drown the whole crap. So... I have the feeling that this is end REALLY BADLY! Captain K. Rool and Baron K. Roolenstein should be costume skins for King K. Rool if he makes it in. As for newcomers, K Rool would be perfect. Hell yeah i want King K. Rool in this game! He would totally be my new main! LET THE MADNESS BEGIN!!! HAHAHAHAHA!!! @erv Yeah that ain't Falco! Already voted for him, another DK rep would be perfect. I'm know if they would make two DK characters as DLC and everyone seems to be giving K Rool attention. I'd be happy to see K Rool too, but both would be good. This is who I voted for. Would much rather have a classic, well known character like him instead if some of this other random anime characters I've seen being voted for. I did my duty, I voted for King Rool! This was who I voted for! We need K. Rool! Yeah! Bring on K. Rool! Funny how Nintendo Life didn't include K. Rool in their poll, now publishes this as if it's coming out of nowhere. He's pretty much one of the top vote getters everywhere I look. I'm pretty sure King K. Rool's already going to be in based on nearly everyone I see voting for him. All of the former Rare employees should just vote for him. Then it would be a guarantee. I hear he's actually in the lead right now, so he seems pretty likely. I surely wouldn't mind his inclusion, though he won't be getting my vote, since I never play with the 'heavy' characters in Smash. The game could use more heavy weighted characters, so sure. Retro created better villains with the Snomads...King K.Rool is kinda stupid...but the original games were pretty good. Honestly the more I think about it, the more I think a monster Hunter would be ideal. It's a character that would draw people to other exclusive Nintendo content, something that would be entirely unique and fun, and something that would be easy (legally) to get into the game. Oh heck yeah. I had being wanting K. Rool of DKC to be in Super Smash Bros. since even before the release of Super Smash Bros. Brawl. We definitely need more Nintendo villains, also Tatanga, Wart, Nergal, Girahim, Vaati, one of the space hunter from Metroid Prime Hunters, Fawful, Cackletta, etc., would be awesome too. It must be a day that ends in Y. There's an article about someone wanting some character in Smash Bros.
Why do you people keep voting for Waluigi?! If you're going to vote for an assist at least vote for Dark Samus instead! Much better! Also a lot more sense too! We need more Metroid characters! I played the trilogy back in the day and I find him as boring and uninspired as Waluigi. That's saying a lot. I would rather have Pauline as another DK character. Yes! I vote King K.Rool! He is one of the coolest DK characters ever! Abso-freaking-lutely. I argued for K. Rool back in Brawl. DK as a series has gotten the shaft so many times in SSB that it's not funny. Only two characters from a series with tons of people to choose from (Dixie would be a close second, she practically writes herself). A series that practically cemented Nintendo as a video game company. They've historically gotten some of the worst stages in Smash Bros. Congo/Kongo Jungle was okay, Jungle Japes was (and still is) pretty crummy. Rumble Falls... Well, let's not go there. And now we have Jungle Hijinx which is a neat idea, but terrible in execution. Fighting in the background for any extended period is a literal eye-strain. Wasn't these guys already backing Banjo-Kazooie? Doesn't matter to me, chose Simon Belmont. I want K. Rool in Smash too! I'll vote for who I want to vote for, thank you very much. And it just so happens that I've already voted for Ridley. Please, someone tell me, why is King K rool is so popular. I played DCK2 and on its other games he does the same. How is this guy memorable? While im usually open to pretty much any newcomer, I rather not have King K rool, and the worst part is, he will probably get in. Well these guys are former Rare devs. Anyway, K. Rool stands a much bigger chance than Banjo Kazooie considering he is owned by Nintendo and all, plus he is the iconic DK villian. Now I just want Camelot to come out and say that they want Isaac to be in the game. @Justin83593 nope, Lego Games are huge, Lego Batman is the biggest, they are actually on Nintendo consoles and it beats characters that haven't been seen in 20 years like K Rool, novelty characters like Walugi or one hit wonders like Shovel Knight. I voted for Captain Toad. That way you could easily get Toadette as a skin since she exists in Treasure Tracker and is functionally identical to Toad anyways. I've been voting for King K. Rool and please send your votes for him! He is too awesome not to be in this game!! "Beautiful children"...Pah! He's ugly as sin. Already went with Lest/Frey, but yeah, Smash needs more villains. Meta Knight and Dedede aren't really considered actual villains when you think about it. Same for Dark Pit. 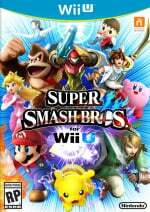 voting doesn’t guarantee that a character will be added to Smash Bros., only that Nintendo will consider it, although any characters that makes it through the approval process will appear on both the Wii U and the Nintendo 3DS. Sakurai has a complicated and in-depth process he uses to choose which characters go into Smash games, and that isn’t likely to change any time soon. Obviously, there are a number of characters that fans would still like to see added to Smash Bros. WhileMetroid villain Ridley might never make his way to the main roster. I think donkey Kong should get more attention. I'll vote for k. Rool cuz I think we need more villains. Platonic will be a legendary developer and I hope that because they want k. Rool in smash bros it points to them working with nintendo. We can hope. I voted for King K. Rool when they announced it. I thought I'd be the only one. I had no idea how popular he was going to be. I would laugh so hard and loud if Nintendo put up this ballot not to determine a character for DLC in Smash, but to get everyone groveling to put their character in. It makes Nintendo the "king" again, like in the old days, and that's exactly what they did with amiibo. It would be absolutely delicious. I mean, this can only end badly, but in a very entertaining way. Seeing as I myself voted for him as well you can bet he is one of my most wanted new characters! All this publicity that he is getting is making me hopeful that it will happen! Have him and Banjo Kazooie in the game and I will be complete. I thought Rare owned the rights to King K Rool and the Kremlings which is why they aren't in the new DKC games. Not at all. Nintendo owns all rights to K. Rool AND the Kremlings, which is why they appeared in DK: King of Swing, DK Jungle Climber, Barrel Blast on the Wii and Super Mario Sluggers. Any DKC characters created by Rare are now Nintendo property and have been forever. As a side note, people; K. Rool and krew are in all of the DKC, Donkey Kong Land games and DK64 all of which are now (or will be soon in the US, for DK64) on the Wii U or 3DS virtual console. Kids who grew up in the buyout era get to actually see K. Rool aside from him being a trophy in Brawl or Sm4sh. @BanjodorfSWF Maybe they worked out a deal with MS for them in those games. Cause from my understanding Rare created King K Rool and the Kremlings for another Rare game originally most people think it was Battletoads but the point being is if they created them wouldn't they be owned by Rare? I've been wanting K. Rool in Smash ever since BRAWL! It sure disappointed me once we learned the full roster of Smash Wii U. Two DKC games where he was a no-show and then he was left out of Smash yet again. @Tasuki Definitely not. The Kremlings were going to be used for a Battletoads game that was in the works at the same time as DKC, but Rare decided to use them as the villains in DKC instead because they found them a good fit for the game. All characters in the DKC games belong to Nintendo. I say meh to King K. Rool. Captain K. Rool, on the other hand, I'm perfectly OK with. We need some K.Rool in this house. With a Kaptain K.Rool and Baron K.Roolenstein alt skin. @allav866: Neither Tiki Tong or Lord Fredrik are seen by most people as memorable. King K. Rool in comparison is very fondly remembered, given the fact that he has been the antagonist for nine games (DKC 1-3, DK64, Donkey Kong Land 1-3, Donkey Kong, Donkey Kong: Jungle Climber, and Donkey Kong: King of Swings); all of which except Jungle Climbers are already available in either the Wii U or 3DS for purchase so it's not like people can't experience him. Plus Retro's Michael Kelbaugh (who is the president of the company) is following the Kremling Kampaigner Twitter which shows that they have not ruled out the concept of bringing them back. Odds are good that they (or someone else) will bring King K. Rool back for Donkey Kong Country Returns 3. 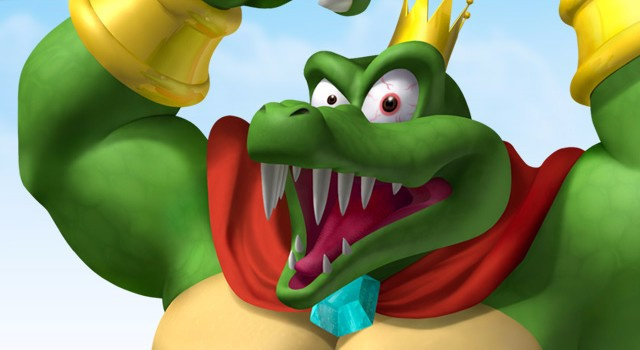 The fans have been clamoring for King K. Rool's return; whenever that is in the Donkey Kong franchise or in Super Smash Bros. and he is probably the most wanted newcomer that has a chance to get in. Also worth noting that DKC 1-3 and DK64 were multi-million sellers and Donkey Kong Country was the reason why the SNES won in North America. The fact that fans still remember him so fondly after all of these years and are doing everything they can to bring him back is not a sign of an obscure character. I wouldn't mind having King K. Rool in SSB4, though I'd prefer to have someone like Dixie Kong if we're gonna have another DK rep.
WHY HAS THIS NOT HAPPENED YET!!!??? I'd rather have General Scales. Aesthetically he is far more interesting while still retaining the character. @astarisborn94 Maybe it's because I didn't grow up with a SNES. I skipped a generation from NES to N64. Even so, I didn't say I would vote for Tiki Tong or Fredrik, I'd vote for Cranky. If K. Rool does make it instead, my reaction will be similar to Duck Hunt's reveal; I'll disagree with it at first, but will eventually be taken in by his charm and accept that he's a viable roster addition. Even I don't care enough to support him o ,o; ~Scurvy, I can get behind tho. Perhaps because I only see him becoming another heavy-set character I wouldn't have the patience to use. K. Rool ♥ If they install K-Rool I might just buy an WiiU................An brand new WiiU. Seriously make K-Rool a character you have to purchase.